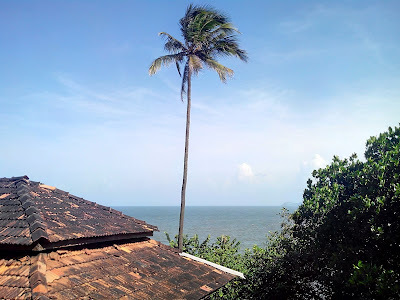 Citing the occasion of my 27th birthday, I set off on a solo one-day trip to Ratnagiri and nearby areas. I had first visited the region for my 25th birthday, and then thrice repeated for good measure. This would be my fifth trip to the region and hence a good trial-room of sorts for my first true solo backpack trip. Now, usually this region deserves at least two full days. I had a constraint of one. 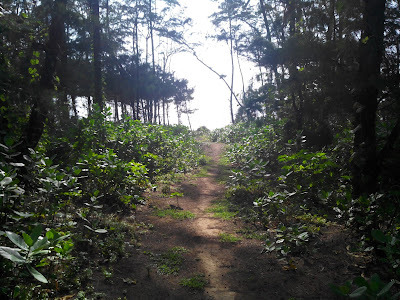 This post is about possible ways to overcome that constraint for a solo backpacker. Information for two day trips and places of interest in the region is easily available and can be covered in a different post. The distance between Mumbai and Ratnagiri is more than 300km one way. The best way to cover this distance is by train. The 10111 Konkankanya Express departs CSTM at 2305 hours every night and reaches Ratnagiri at 0630 hours the next day. This coupled with typical Konkan Railway delays will mean an actual arrival time of 0700-0730 hours. The train washrooms are mostly OK and can be trusted for the morning chores. The drawback is that since this is a busy route, the reserved tickets sell out much in advance. Almost all trains on the Konkan Railway route halt at Ratnagiri, so other options are available. 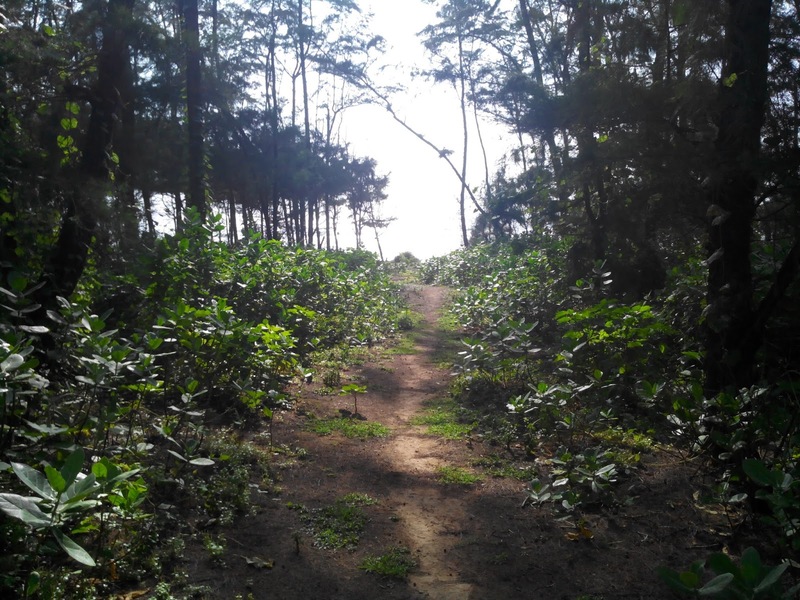 But, the Konkankanya is best suited to spend most of the productive day-time in the area. Bus journeys take longer, with many options available. The first pit-stop is where you would ideally find a place to take a bath and have a breakfast. Ratnagiri city has a few hotels near the bus-stand area which can be used for this. A better way would be to take the first bus out to Ganpatipule. Ganpatipule, being a temple-town, has a few places which would actually let you freshen up and dump your luggage in a locker for a small token. These are efficient and good on the budget as well. Ganpatipule has three bus stops, alight on the second (middle from either end) stop. A minute’s walk away is a modest hotel to change and lock your luggage. It is usually sometime around 0800 hours that one would be done with the bath and chores at Ganpatipule. The regular tourists do not start pouring in till about an hour later. 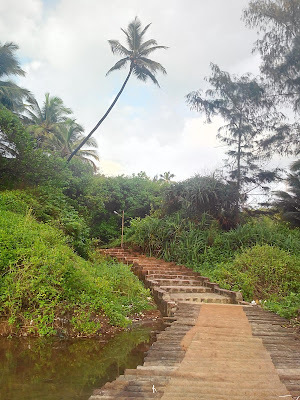 A quick and quite darshan ensues, followed by the scenic pradakshina (parikrama/circumambulation) route which starts from the northern edge of the temple, circles the adjoining hill through the east and the south, heads west to the beach and then back to the temple. Beach activity here is best kept limited to walking in ankle-deep water, due to the notoriety of the undercurrents at this beach. By about 0900 hours you are done with the temple and the beach and the shops have started opening up. Time for breakfast. Staying back for lunch here is enticing, especially for the modaks, but the packed one-day itinerary demands that one leave immediately after breakfast. The second pit-stop is a place to lunch at, after some peaceful sights. From Ganpatipule, one can head north towards Jaigad, halting at places like Malgund and the JSW Ganpati Temple or any of the beaches that stretch along the highway on the way. A drawback here is that public transportation and food is scarce in these parts. The logical option for a solo backpacker is to return to Ratnagiri.It will be about 1045 hours by then. From here one can hire a rickshaw and head to either the Ratnadurg fort or the Thibaw Palace as per ones taste. I would any day prefer the fort though, walking along the ramparts on majestic cliffs overlooking the foaming sea. 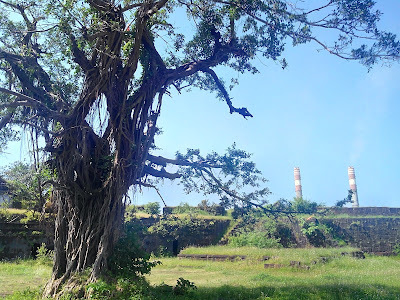 One can be back at the Ratnagiri bus station by 1200 hours after covering the fort and then head for lunch. Amantran is locally well-known for its offerings. Post lunch, one can do the Tilak Memorial or spend some time at the Mandwi beach as a pseudo-siesta. Returning to the Bus Depot by 1400 hours, one can catch any of the south bound buses to Pawas, 30 mins away. 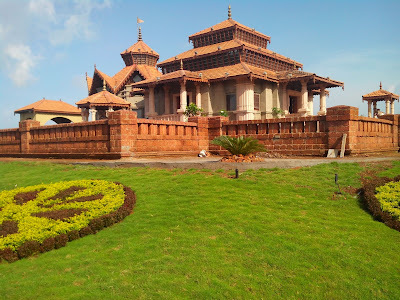 Once in Pawas, head east to the Swami Swarupanand Devasthan. Peace is the calling card of this place. Spend some time here, and have a sip of fresh panna or kokam sarbat before leaving. The ones who are pious at heart would do well to make Pawas their second pit-stop and take part in the aarti which begins at 1200 hours followed by a very tasty mahaprasad. Aim to reach the beach by about 1600 hours so that the Sun has begun its descent and the heat dosen’t sting. The beach is safe for a little play, but venturing too far in the water would mean putting yourself at the mercy of the unpredictable undercurrents. 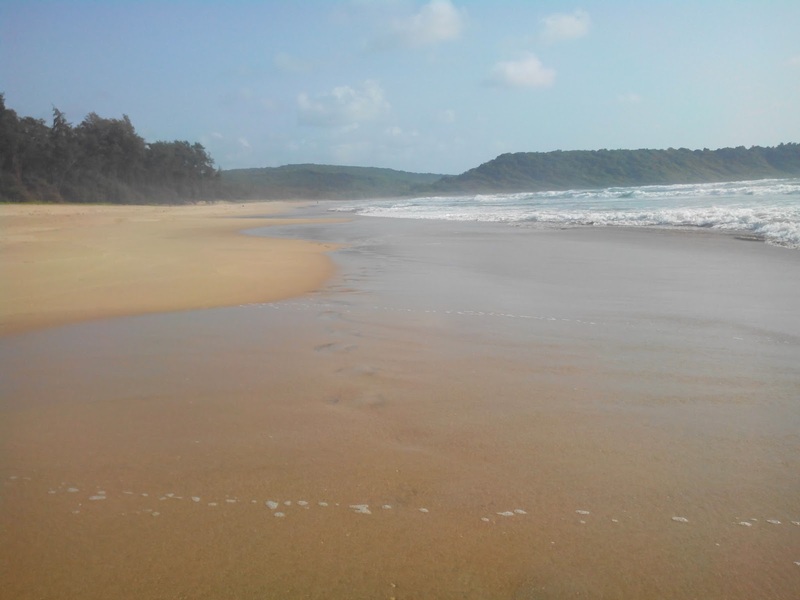 Changing facilities and fresh water are available at a wadi (Ganeshkrupa Bhojanalay) near the northern end of the beach. 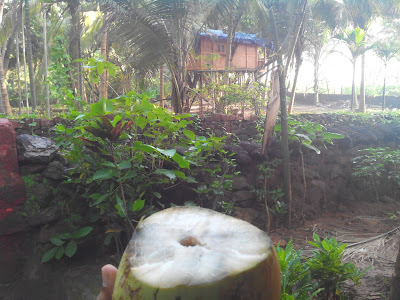 Ask for a coconut here and they’ll offer you a fresh one directly plucked from the palms in the wadi. 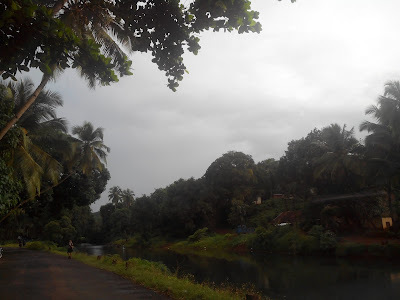 Take the last bus from Ganeshgule to Pawas at 1700 hours. Missing this bus would mean being potentially stranded there. Ganeshgule, anyway, is a beautiful place to be stranded at. 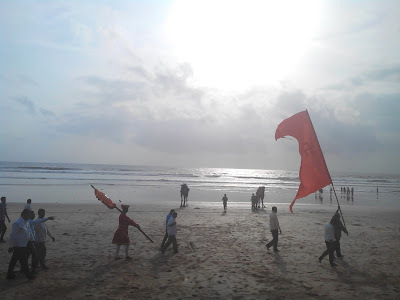 From Pawas, catch any bus heading to Ratnagiri and alight at Bhatye beach to watch the sunset and grab a quick bite at the local stalls. Locals come out in large numbers here. Leave Bhatye by 1930 hours. Catch any of the buses plying to Ratnagiri. 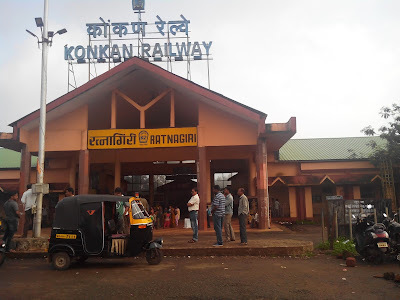 Grab a quick bite and head to the Ratnagiri Railway Station. The 10112 Konkankanya Express departs Ratnagiri at 2200 hours. The train is extremely vigilant during its return journey and will more often than not drop you off at Dadar by 0530 hours the next day. Buses usually leave by 2030 hours and reach Mumbai by 0700 hours next day. 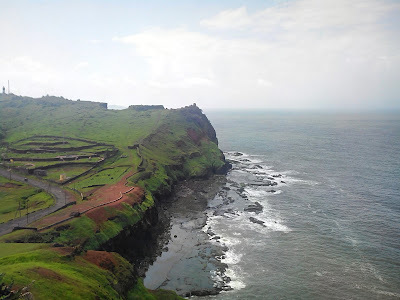 The Ratnagiri area is one of my favorites when it comes to travel. There are many lesser known but beautiful places to be seen here only if one is prepared to look. One of the common traits of most of this places is the peace that permeates through them. 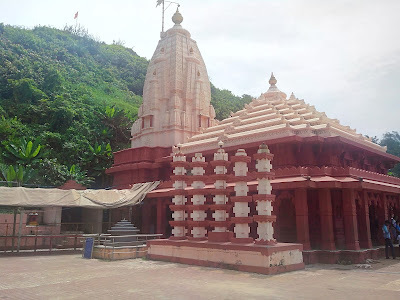 Cases in point being the Lakshmi-Keshav temple located next to a water-carved ravine and the rare Kanakaditya temple. Evenings at forts have a special sense of nostalgia too. I like to call this area as my personal paradise. Its close at hand, the people are helpful and at the same time share a lot in common with me.